The main difference is that hostels provide a budget oriented, community based, social environment for travelers. Hostels also create an environment perfect for fostering new friendships. The shared living style provides many opportunities to connect with interesting folks from around the world. For example, if you’re brushing your teeth in the bathroom, you can awkwardly say hi when someone walks in (only if they can decipher toothbrush talk). Or if you’re hanging out in the kitchen area, you can strike up a convo about what your fellow backpacker is cooking for dinner. Bonus: they let you sample the dish. Because of the social atmosphere, we’ve had the opportunity to learn about the cultural quirks of numerous countries and even learned to speak some Chinese from our new friends. There are a tremendous amount of variations between hostels and locations, but we can speak best to ones in Australia and New Zealand. Typically, you have the option to book a private room or a dormitory bed. The private rooms come with either a double bed or two single beds. The dormitory rooms are generally a room with bunk beds, and the sizes can vary greatly. “The more the merrier” in hostel world translates loosely into “the more the cheaper.” For example, the pricing could go something like this: 12 bed dorm – $22, 10 bed – $24, 8 bed dorm – $26, 6 bed dorm – $28, and you get the idea. When I was in Fiji I even stayed in a 180-bed dorm room, but that is extremely rare. 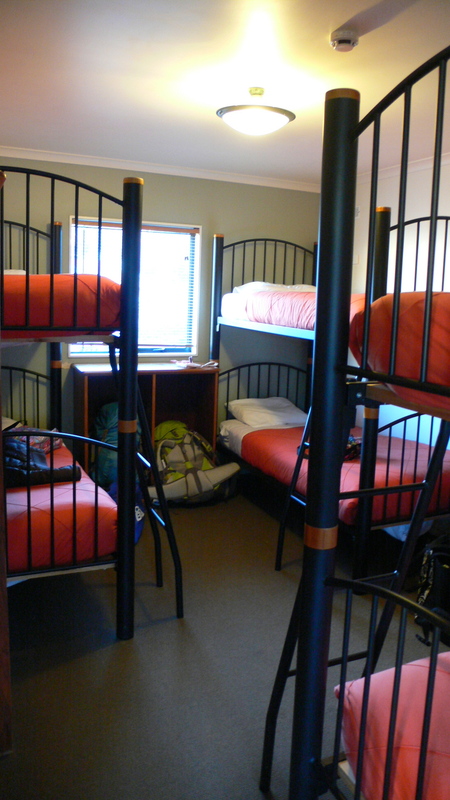 For most backpackers like us, the dorm room is definitely the budget option and therefore, the most popular choice. The general hostel setup is comparable to a college dorm because there are usually community bathrooms, common lounge areas, and laundry rooms. Some hostels even resemble a big house divided into individual rooms. Hostel services can include: bar or cafe, book exchange, breakfast, desktop computers, Wifi, DVD movie selection, organized activities, hair dryers, pool tables, bike hire, hot tubs, pools, saunas, luggage storage, tour desk, or transportation booking. What more could you possibly need? Do you have to eat out every meal? Backpackers are a savvy breed of people. This means they know that eating out every meal adds up fast. 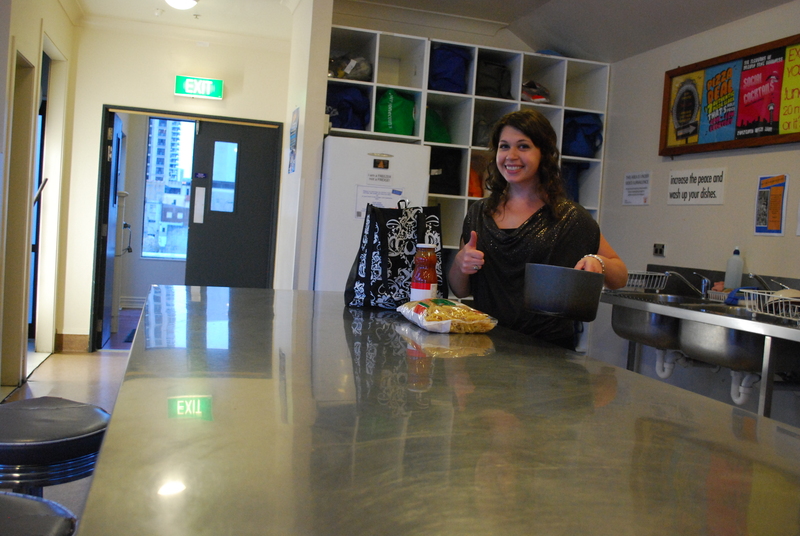 This is why hostel goers often opt to cook their own meals in the community kitchen which is stocked with fridges, ovens, microwaves, and all the cooking equipment and dishes you might need. Won’t your stuff get stolen? If you create the opportunity, maybe. But in the words of Elmhurst College Campus Security, “Lock it, or lose it.” Most hostels provide lockers for you to store your precious valuables, and all you’ve got to bring is a padlock. No worries. For the hostels that don’t have private lockers, we’ve found that since everyone is in the same boat there’s usually no problem. If you wouldn’t want your stuff to be stolen then you probably wouldn’t steal from someone else. We did have a minor incident including a dairy theft. About a half a cup of our milk was stolen, but luckily no one on the scene was injured. However, since almost every backpacker has a half-gallon of the same “home brand” milk, we think it’s quite possible it was an accident. What type of people stay in hostels? Again, it completely varies. It’s hard to pinpoint a specific demographic, but you are always surrounded by a group of likeminded travelers. It’s definitely most common for people age 18-35 to stay in hostels, but we’ve also seen families and older couples as well. We’ve found many of our hostel roommates to actually be quite helpful because they’ve often just come from a city or country that we’re going to and are more than happy to offer personal travel advice and suggestions. Don’t think that you have to travel abroad to experience a hostel. We stayed in one when we visited New York City, and they can be found in most other major cities in the world. So answer this: why aren’t you livin’ la vida hostel? Posted on June 30, 2011, in Destinations, New Zealand and tagged accommodation, australia, backpacking, budget, budget travel, Coley Nelson, hostels, Kim Pitingolo, Magc Bus NZ, new zealand, Travel. Bookmark the permalink. Leave a comment.